Bringing the revolutionary benefits of 3D printing to the mass production plastics manufacturing industry. There are currently two dominant 3D printing methods. The current industry standard in additive manufacturing. This method prints using a moving nozzle or laser to manually and slowly draw each layer of an object bit by bit. It typically takes many hours to produce a single small object. This method sweeps across the bed, printing an entire layer as it goes, or uses a projector to cure liquid resin held in a vat, creating entire layers in the build chamber simultaneously. By far the fastest way to produce objects. 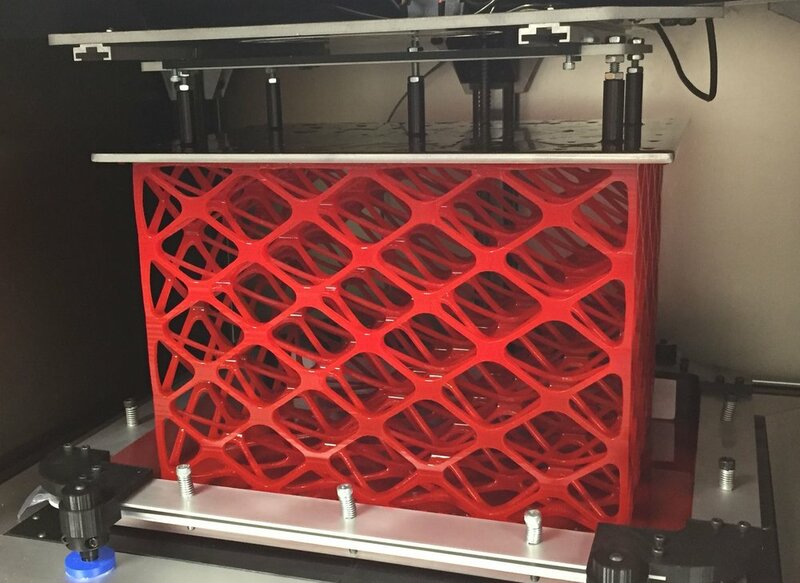 Printing entire layers at once also allows for the printing of multiple objects in the build chamber simultaneously with no loss of speed. One of the biggest challenges in the industry is to scale this method to larger build chambers while overcoming the issues of distortion, suction, and resin flow. So... how do we do it? 3D Currax’ unique proprietary LCD panel and printing technology has done just that. Using an LCD panel as a dynamic mask allows us to perfectly control and columnate the UV light of every individual pixel, drastically improving printing resolution and eliminating the distortion encountered by other printing methods when scaling to larger build chambers. We have developed a system which allows our printers to self-optimize based on hardware feedback they receive in real-time, drastically reducing their per-layer cycle time and improving print speeds to a degree that allows us to compete with injection mold machines. We call it the React1. A problem resin based 3D printers encounter when curing whole layers is how to deal with the suction forces and Van der Waal effects generated when the top plate lifts the object being printed from the build chamber floor after curing each layer. When scaling to large builds, these forces can become massive. We have developed three systems that solve this issue, and enable the release of objects from the build chamber floor without slowing down the speed of printing, even when printing large, solid mass layers. These three release systems can engage individually or together, depending on input from the React1 and guided by the adaptive AI software we are developing. Both the React1 and our release systems are fully scalable to any size of printer. Cleaning and finishing of 3D printed products can add many man hours per unit, depending on the object in question. Post processing is therefore a major hurdle that must be overcome before entering the mass production manufacturing market. We’ve come up with an automated, customizable, interlocking modular system that connects with our printers. Shown is our printer connected to a washing station, followed by a UV curing station, a heat treatment station and an ejection chamber. Using robotic aI bin picking, which is a combination of 3D scanning and camera technology, parts can be taken from the ejection bin, scanned, cleaned up if supports are used, and then robotically transferred to packaging or into a tumbler if a desired finish is requested on the plastic parts. The PF System will equip our machines with hardware and software detection systems that will monitor all aspects of our machines. This will allow our aI software to remotely detect any issues or variances prior to malfunction, and share this data across the network. additionally, parts will automatically be ordered before they wear out, and delivered for installation to minimize any downtime. This will incur a monthly fee that will be mandatory on all leased and warranted machines. This is the future of manufacturing – artificial intelligence, the use of computer algorithms, and integrated robotics represent a revolutionary step forward. Injection molding is not capable of adapting, nor are most 3D printers. Our 3D printers can take advantage of these developments. For mass production of plastic and composite products, 3D Currax’ technology is the path to this future. We're developing cutting edge resins with properties that enable the creation of all sorts of plastic products. Besides our proprietary resins, we plan to create a market for open source resin creators, to incentivize them to develop resins for our high production machines. We envision these creators receiving licensing or royalty payments for their creations, which will be produced by us and integrated with our proprietary resin delivery system. Our focus is to make resins that create finished products, and move high-volumes at extremely low prices so that finished products can be made with competitive pricing, such as is found in the injection mold manufacturing industry.